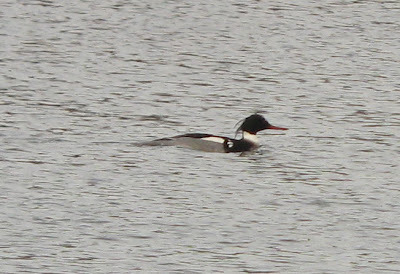 Red-breasted Merganser - male, Unity Park, Barton Cove, Turner's Falls, Franklin Co., MA. January 30th, 2010. 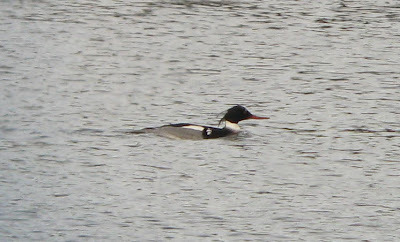 Nice male Red-breasted Merganser off Unity Park, Barton Cove this afternoon - present through to dusk and then flew upriver and out of sight. 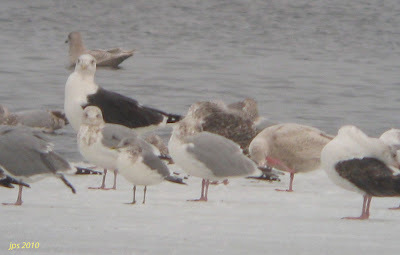 Gull numbers were small this evening, the smallest for a while with perhaps less than 300 hundred birds but still containing the two regular adult Lesser Black-backed Gulls and a first-cycle Kumlien's Gull. 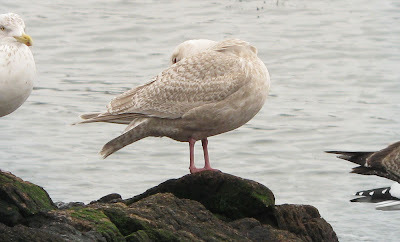 Kumlien's Gull - first-cycle. Long staying first year, present for at least one month. Unity Park, Barton Cove, Turner's Falls, Franklin Co., MA. January 30th, 2010. 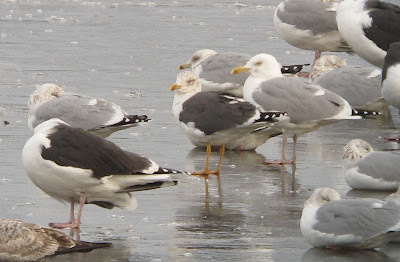 Lesser Black-backed Gull - adult. 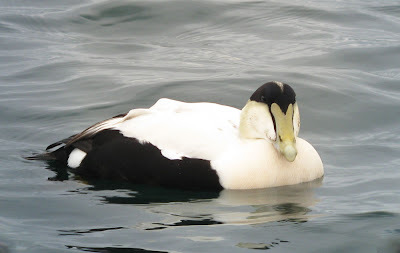 Long stayer, present for at least two months. 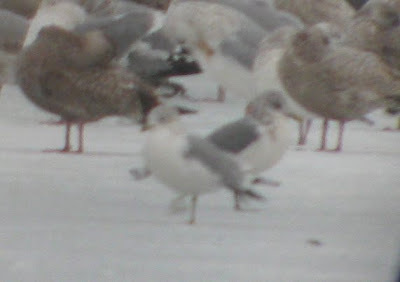 This bird has rather weak-toned, yellow-orange legs. Unity Park, Barton Cove, Turner's Falls, Franklin Co., MA. January 30th, 2010. 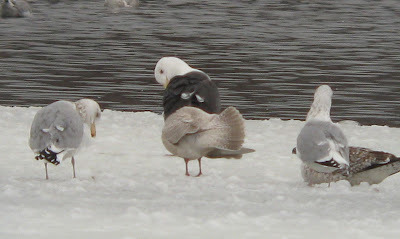 Lesser Black-backed Gull - adult. 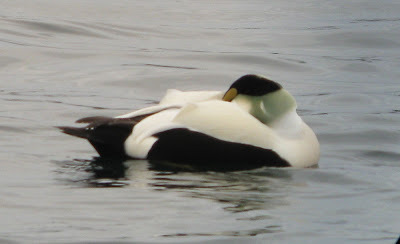 Long stayer, present for at least six weeks. 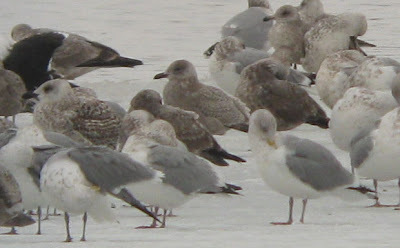 This bird has bright egg-yolk yellow legs, quite different to the bird above. 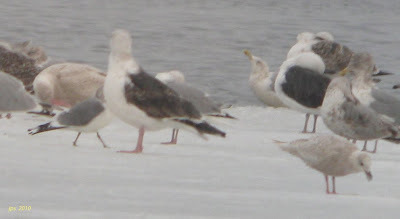 The leg color is also becoming more intense as we edge towards spring. Unity Park, Barton Cove, Turner's Falls, Franklin Co., MA. January 30th, 2010. 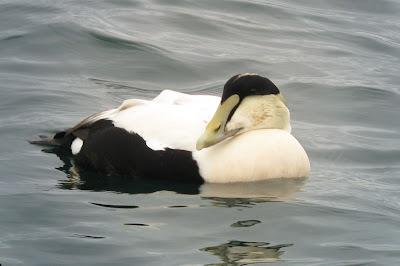 Common Eider selection, all from Macmillan Wharf, Provincetown Harbor, MA. 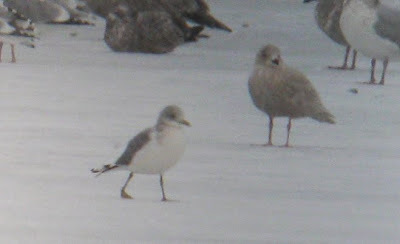 January 17th, 2010.
unidentified first-cycle gull - East Gloucester, Essex Co., MA. January 20th, 2010. 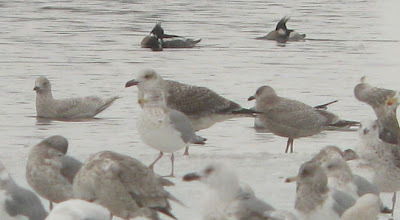 Larger and bulkier than Kumlien's Gull (right). Although Nick Bonomo and I had a cracking day of gulling in East Gloucester, our session got off to a shaky start with this bird. We found it just off Rocky Point Road and couldn't have wished for better views. After thirty minutes we moved on feeling completely baffled by what we'd seen! 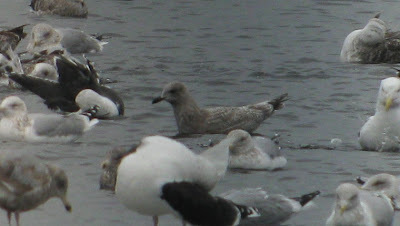 We discussed several possibilities, including hybrid combinations, but I couldn't help wonder why it wasn't a pale-end Thayer's Gull? 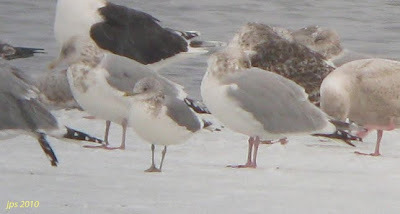 It was obviously large, maybe too large for a typical Thayer's but beyond that many features, including a nice set of unmolted juvenile scapulars, looked to be OK for Thayer's. 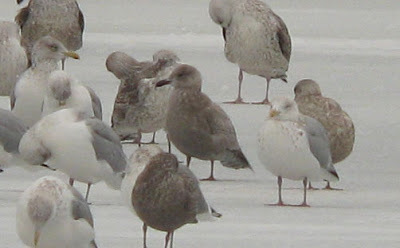 I also wonder how we would have treated the bird had it been several shades darker? 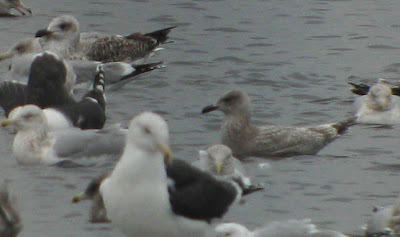 Later in the afternoon we had little trouble locating the same, distinctive individual at Niles Pond. 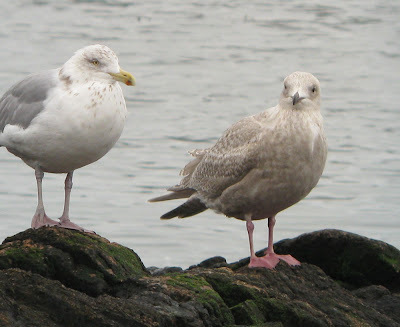 This time it was surrounded by hundreds of Great Black-backed and American Herring Gulls and didn't look quite so mighty as it had done in Gloucester Harbor. 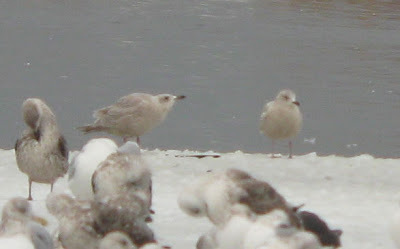 However, it still looked considerably larger and bulkier than most Kumlien's Gulls present. NB. 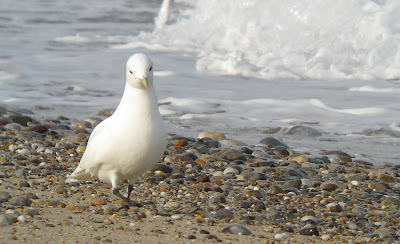 Jeff Polken's wonderful Thayer's Gull images are well worth checking out, including many pale birds. 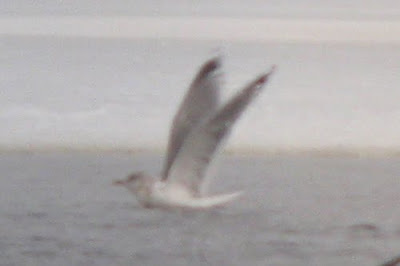 As always, comments on the identification would be most welcome. 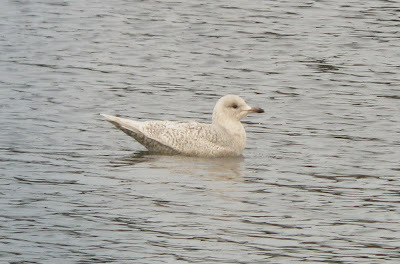 Thayer's Gull - first-cycle, Niles Pond, East Gloucester, Essex Co., MA. January 20th, 2010. 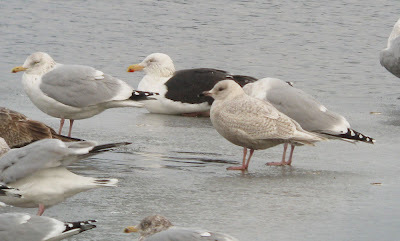 Another exciting element to the phenomenal gull show at Niles Pond, East Gloucester. 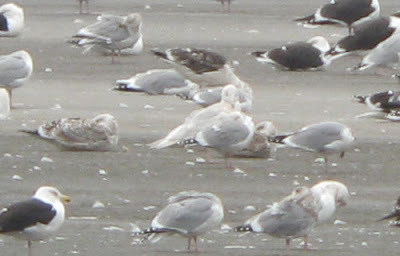 This first-cycle Thayer's Gull was one of our first finds of the afternoon and was present for over an hour through to 14:00hrs. 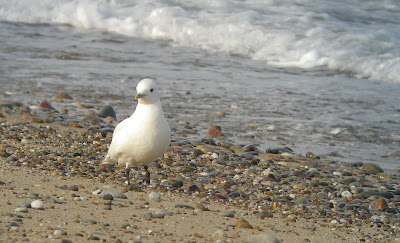 Surely, East Gloucester must be the most reliable spot in New England for finding Thayer's Gulls? 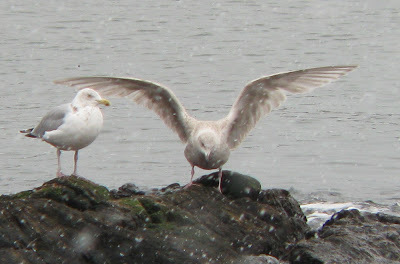 Thayer's Gull - center. Primaries looked blackish most of the time but under certain conditions, true color (actually dark brown) becomes more apparent. 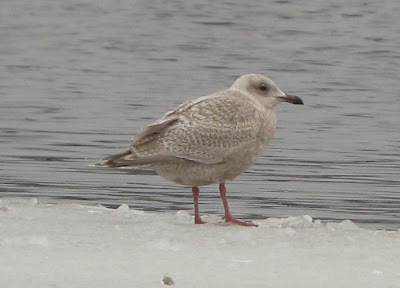 Mew Gull - adult, form uncertain, Niles Pond, East Gloucester, Essex Co., MA. January 20th, 2010. 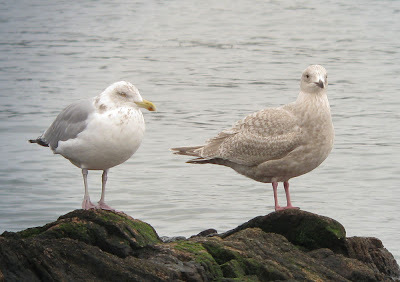 Here with Great Black-backed, American Herring and Glaucous Gulls. 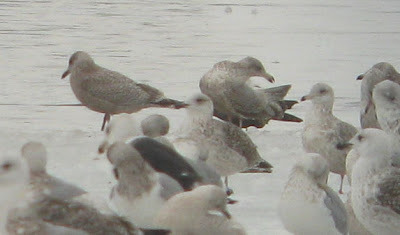 Adult Mew Gull found at the last minute, right at the end of an afternoon of concentrated gull watching at Niles Pond, East Gloucester. 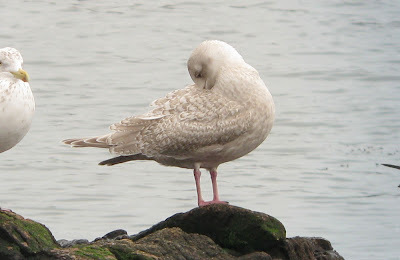 Conditions deteriorated towards the end of the day with bitterly cold winds and heavy flurries of snow, therefore Nick Bonomo is to be commended for picking out this bird just as we were thinking about leaving. 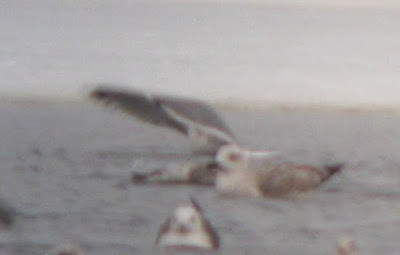 We observed it for twelve minutes before flew off SE out to sea. 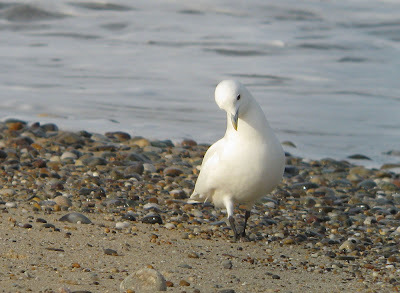 Nick also managed to pull some decent digiscoped shots which can be seen at his excellent Shorebirder blog. 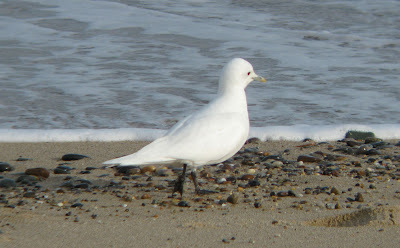 Initially thought to be brachyrynchus, there appear to be strong similarities between this bird and a well photographed bird at Brace Cove in early December, 2009. 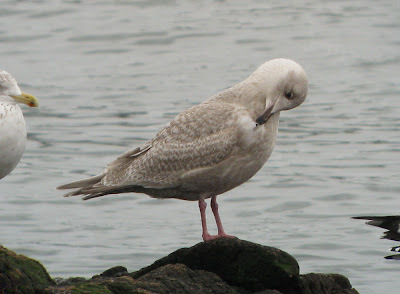 Phil Brown has an excellent image set of that bird here and a write-up by Rick Heil suggesting kamtschatschensis for the Brace Cove bird, actually first found by Rick in Gloucester Harbor in late November. 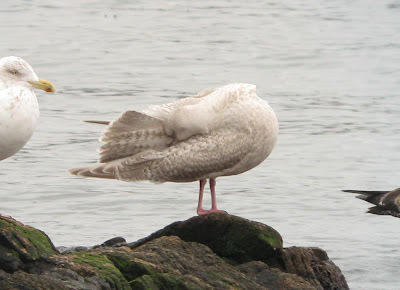 Nick and I are seriously considering the possibility that our sighting involves the bird same......more to follow. 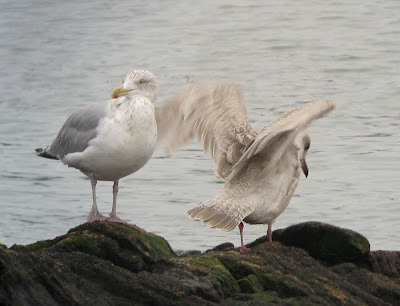 After a near miss (by one day) at Plymouth, MA last January 2009, we didn't expect to be given a second chance so soon. 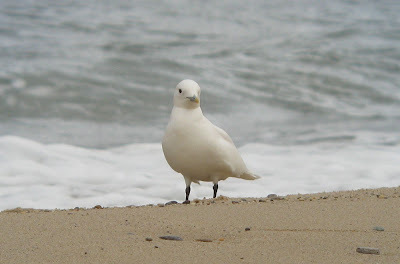 The discovery of this bird on a Provincetown beach on January 14th had both myself and Susannah on edge for several days before our first opportunity to go finally arrived on Sunday morning. A family twitch ensued. We left Amherst at 0540hrs and arrived at Race Point parking lot at 0915hrs after a pleasantly traffic free drive. 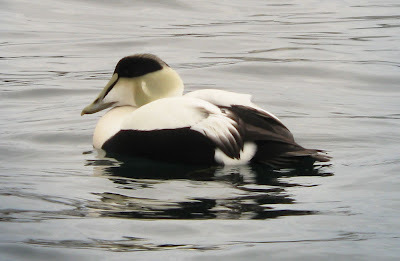 Conditions couldn't have been better for mid-January - nice and mild, nearly windless and partly cloudy. 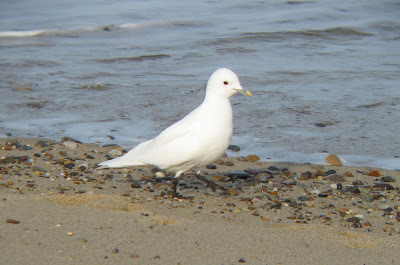 The bird itself was walking (quite literally) down the shoreline at a nice pace, picking at food items as it went. It was just a question of staying put and letting the bird walk past. 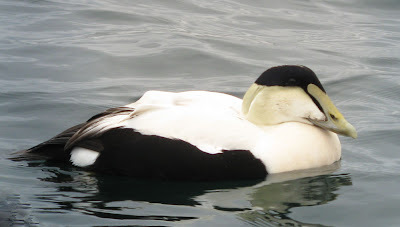 During our two hour stay, it was constantly on view, much to the delight of a steady stream of birding visitors. 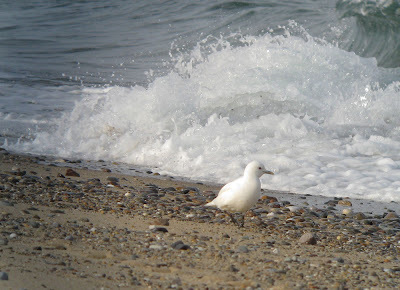 It was also the only gull on the beach during that period. 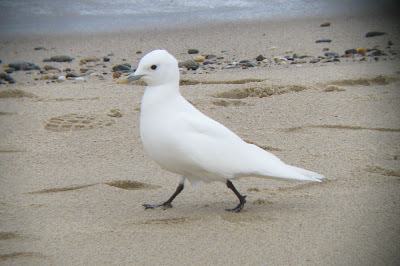 All in all, it was quite bizarre - a stunningly beautiful gull parading up and down the beach on foot, and no apparent fear of the public. 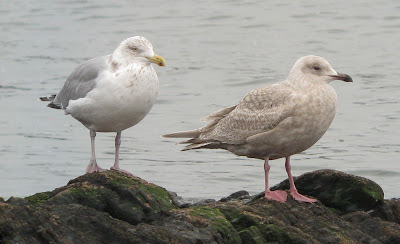 The day went on to produce seven more gull species; Black-legged Kittiwake (40+), Kumlien's Gull (11, including 8 adults), Lesser Black-backed and Glaucous Gull, plus American Herring, Great Black-backed and Ring-billed Gulls, recalling another outstanding day for gulls on the Outer Cape back in November 2008. 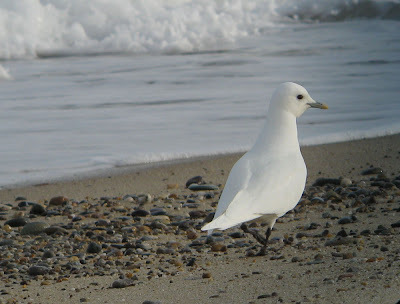 A truly amazing place for birding. 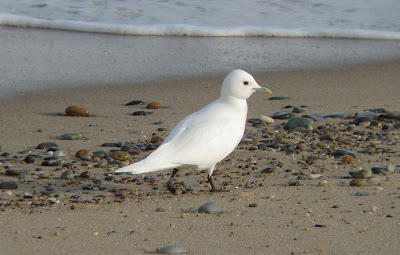 Ivory Gull - Adult, Race Point Beach, Provincetown, MA. January 17th, 2010. Found by Ivan Ace and Ed Yargeau on January 14th. 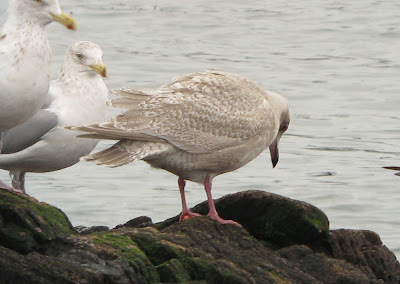 Glaucous Gull - Second-cycle (center), Pilgrim Lake, Truro, MA. January 17th, 2010. 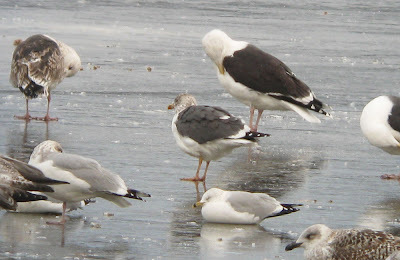 Lesser Black-backed Gull (left) and adult Kumlien's Gull (right) with American Herring and Great Black-backed Gulls. 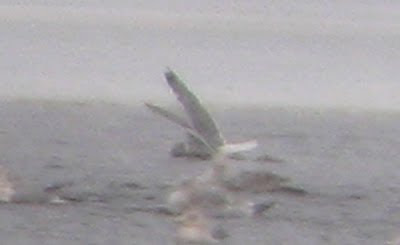 Pilgrim Lake, Truro, January 17th, 2010. 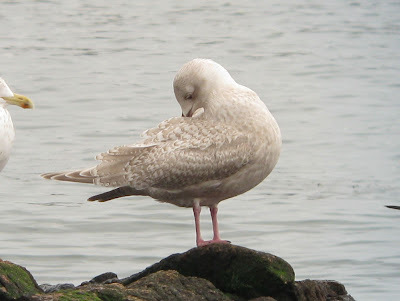 Gambian Gull - November 17th, 2007.